You can tell it’s the mid-sixties because they’re dabbling a bit with production gimmicks. I think it’s their coolest-sounding record, one of their best compositions, and Frankie Valli at the peak of his vocal prowess. 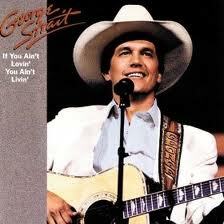 Since I picked on George strait for “Check Yes or No”, it seems only fair that I spotlight one of my favorites by him. Anyone who claims that he doesn’t sing with emotion should listen to this one again. One of Elvis’ heroes. Check this out toot-sweet. 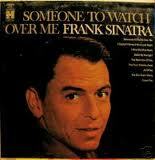 Or anything by my man, Frank. Most people don’t know that after country music, this is the genre that feels the most innate to me. This song has always been one of my favorites. “I Wanna Be Loved Like That” is great too. 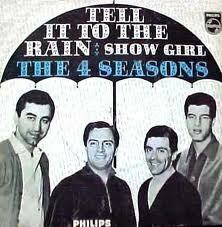 I have the 45 of “Tell It to the Rain”. Good song. I finally got to see “Jersey Boys” 2 years ago and it was great. I’d like to see it again sometime. For my oldie but goodie here I’ll go with a #1 hit from 1961, “The Lion Sleeps Tonight” by the Tokens featuring Jay Siegel. My musical tastes don’t go back very far at all, so one of the oldest songs that I really like is “She’s In Love With the Boy” by Trisha Yearwood. DIFFERENT DRUM (The Stone Poneys featuring Linda Ronstadt): A high point of the California folk-rock movement of the late 1960s, this Mike Nesmith-penned hit (which reached #13 in January 1968) has some pretty heavy lyrics (a young girl not wanting to get tied down in a relationship) being sung by someone who wasn’t any older when she recorded it than Taylor Swift is today. Even then, however, Linda was showing the kind of heartfelt emotion and power that would make her one of the most influential female singers of all times in any genre, pop or country. 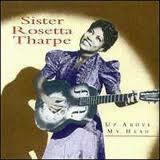 “(You Lift Me Up) To Heaven” by Reba. The song is corny but I keep hearing it on the radio and for some reason can’t help but like it. I think I’m going to go with Smokey Robinson & the Miracles’ “You Really Got a Hold On Me” or The Drifters’ “Save the Last Dance” for this one. Since Tara mentioned Sinatra, I’ll just say that I’ve been developing quite an affinity for “New York, New York.” Something about all those classic retro-sounding horn arrangements always makes me smile. “Somebody Should Leave” is my Reba pick, still powerful and relevant after over 25 years, and still leaves hope for a McEntire like there was in her hey-day. For my pick to allow for a variety of artists in my 30 day selection: Despite a release of a mere 18 years ago, “The Song Remembers When” reminds us of a time gone by when country music actually made you think and was witty and incisive, Trisha Yearwood’s classic song remains one of her best singles of her distinguished career. I’m not sure what qualifies as an oldie, but I’m feeling “Give Me More, More, More (Of Your Kisses)” by Lefty Frizzell. If I Can Dream by Elvis Presley. His best, in my opinion.